I think I'll give up trying to catch-up. I just about got there a couple of weeks ago and then, well everything turned to custard (if custard is the right term for travelling and exploring) and now I'm back where I was, half a dozen blogs behind again. 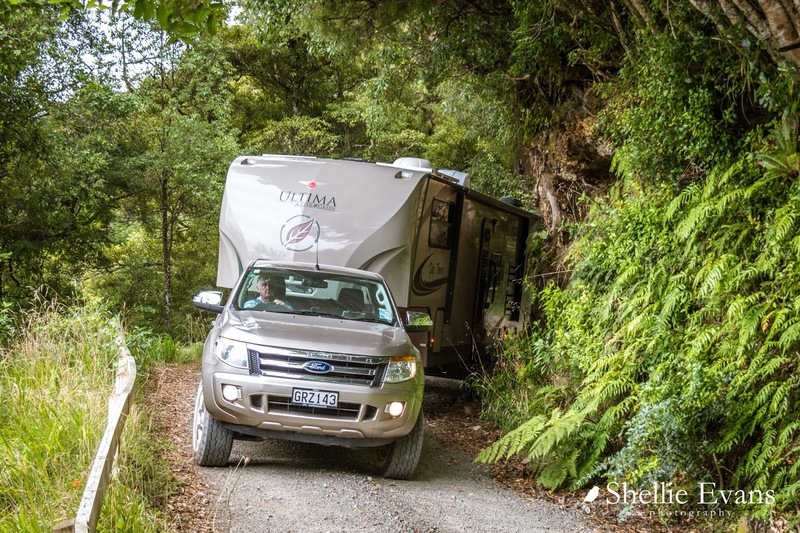 So just pretend we've just left Mahia and you have no idea where the heck we are at the moment (Te Araroa, East Cape if you're wondering). 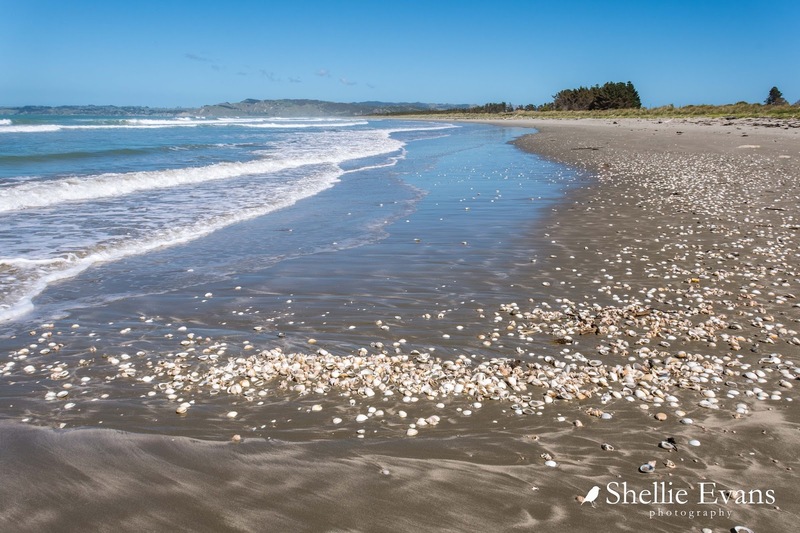 I've been looking forward to visiting Mahia for a very long time. 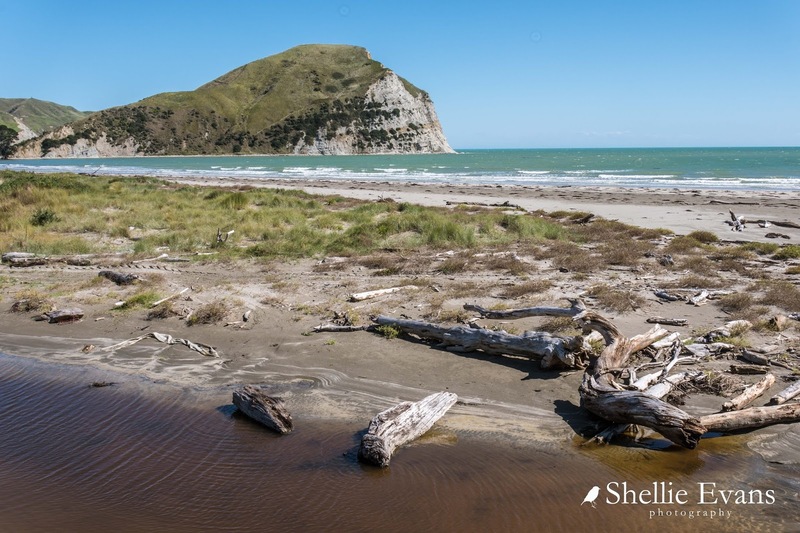 Mahia Peninsula forms the top curve of Hawke Bay and is a popular holiday playground for many that live in Hawkes Bay. Mahia was our family's regular summer holiday destination when I was a child. 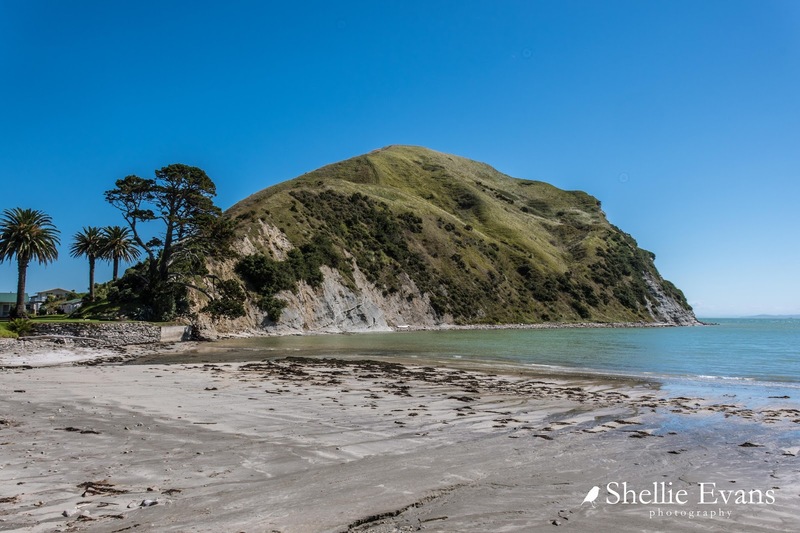 Nothing signifies Mahia Beach and carefree summer holidays to me more than the white-cliffed headland of Mokotahi which dominates the eastern side of Blue Bay and is right beside Mahia Beach. We were very lucky and extremely grateful to be able to park on the front lawn of a bach that belongs to some very good friends. 'Stay as long as you like' they said, 'plug into the power, use the washing machine' they said. So we did and it was heaven for a whole 10 days. We arrived in the rain storm that sent us packing from Lake Waikaremoana and as you can see David, with limited visibility, did a magnificent job of backing the rig over the wonky wooden bridge and angling it so the slide-out had room. And that is where we stayed for the duration. We had a good view of Mokotahi except for the poles and wires of civilization. 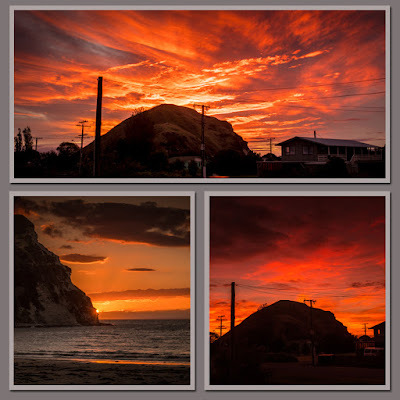 I did head to the beach a few times to catch the sunset but as per Murphy's Law, they weren't the nights for great displays! 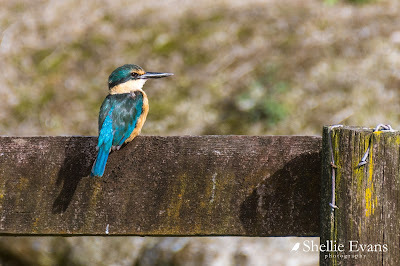 Although this fisherman provided me with the perfect subject one evening. One of the first places I was keen to check out, was the bach our family used to stay in. It was a great surprise to find that it, along with the bunkhouse, was still standing and looking very well looked after. 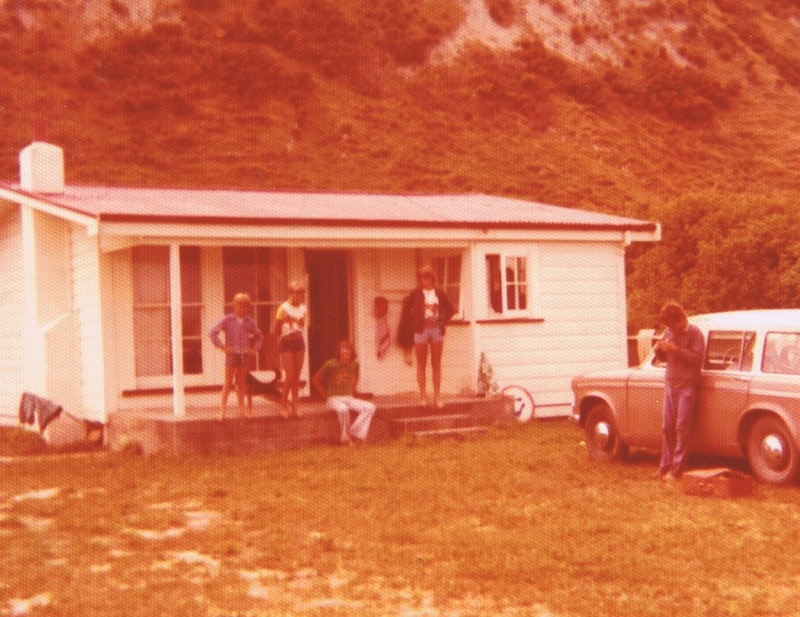 Here she is circa 1976, that's my brother & sister on the left, a friend, and my aunty and uncle (who are our ages and holidayed with us often) on the right. Back then there was just scrub and dunes behind and to the side of the bach. 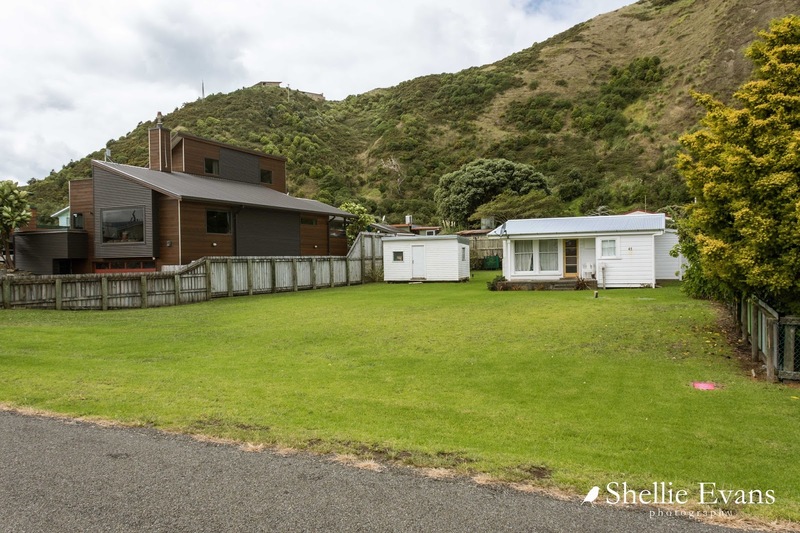 Now there are large holiday homes on either side and a whole lot of homes behind. 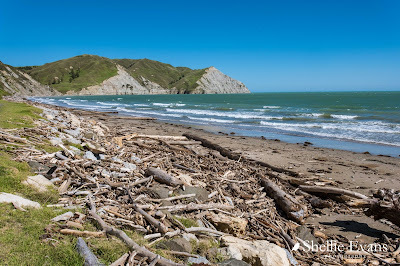 Once the weather cleared I made a pilgrimage to a few more familiar places- an exposed and driftwood strewn Taylors Bay which is on the ocean side of Mokotahi. 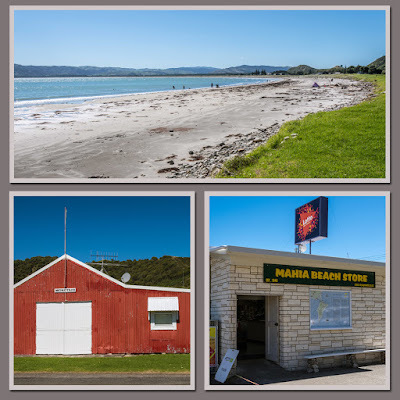 A deserted Mahia Beach, the old (and I'd say now historic) red shed bach named Mokotahi which sits on the front row across the road from the boat ramp and beach, and Mahia Beach Store which has had a bad face lift at some stage. Mokotahi on a blue sky day- as kids we would climb to the top at least once during the holidays. There's now a public track to the top but I decided Mokotahi must had grown since my youth. It wasn't the going up that worried me, it was the coming down and the agony I'd put my poor kness and toes through. I have another special connection with Mokotahi. A very friendly bottle-nosed dolphin is named after the headland. Moko, a young dolphin arrived in Blue Bay and made friends and swam with the many humans who came to visit him. 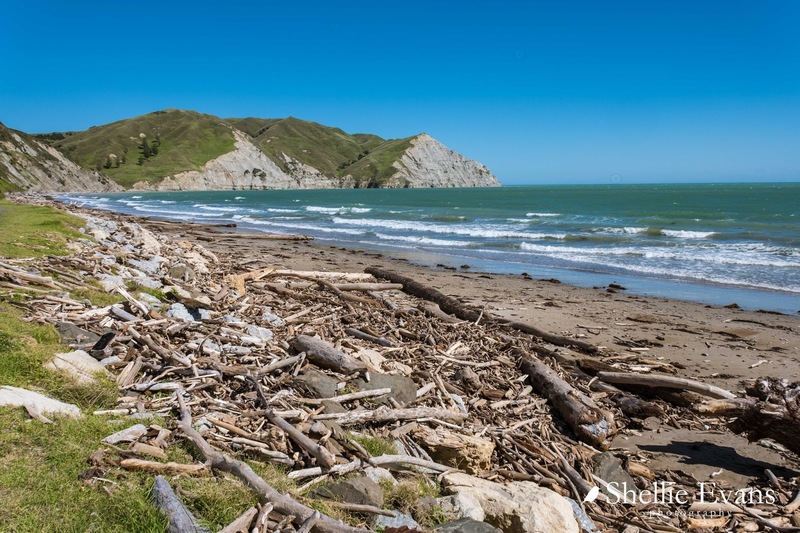 He was named Moko by the locals and he stayed nearby for 2-3 years until 2009 when he followed a fishing boat north to Gisborne and then after a few months north again, following another trawler, around East Cape and onto Ohope & Whakatane. 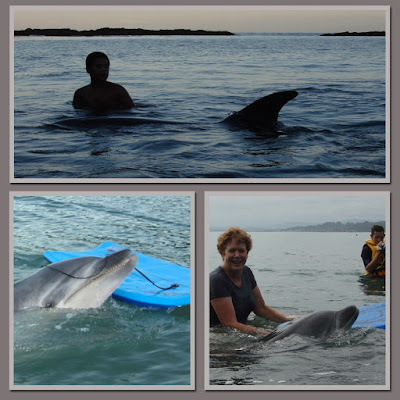 I became involved with Moko after he arrived in Whakatane, I travelled over from Tauranga several times to visit and swam with him during the months he was there. He again followed a fishing boat to Tauranga where I saw him for one last time before he met his untimely death. I documented my meetings with Moko and his farewell memorial on a blog 'My Mate Moko'. I have Moko to thank for my 'Two Go Tiki Touring' blog; it's when I started blogging. Click the link above if you'd like to read Moko's blog- don't worry it's (sadly) not too long. Click on February in the right column to start at the beginning and make sure you listen to the songs and speeches in the last entry which is the memorial; they'll break your heart and make you laugh at the same time. Well that's enough of that, it still makes me sad thinking of poor Moko- gone from the sea but not from our hearts. My next stop was where the Blue Bay Holiday Park used to be located at Opoutama, the family stayed here a couple of times in the cabins. The holiday park was set in amongst a big plantation of pine trees; the trees have now gone and the area has been partially developed and subdivided off. The sites have only recently been re-sold after the initial developer went belly-up. 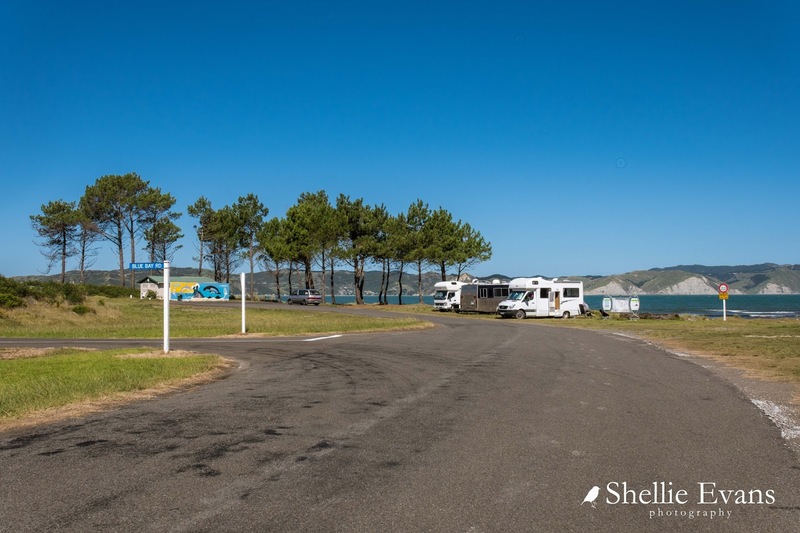 There's now also a freedom camping area down on the waterfront. 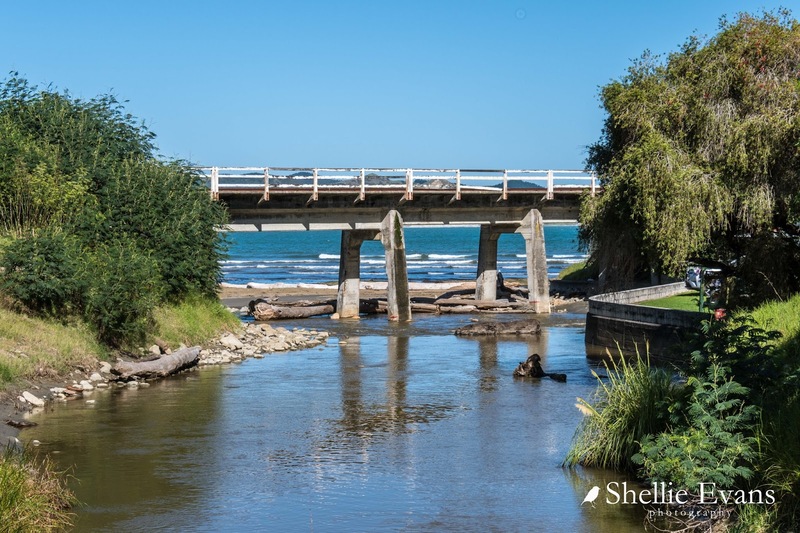 Tucked into the corner of Blue Bay is a rail bridge that crosses a small stream; I remember we used to swim and play in the stream under the bridge when we were little. I headed south over the hill to Waikokopu Wharf, stopping on the main road where there used to be an old house (a railway house I think), just north of another rail over-bridge and just before the turnoff to the wharf. 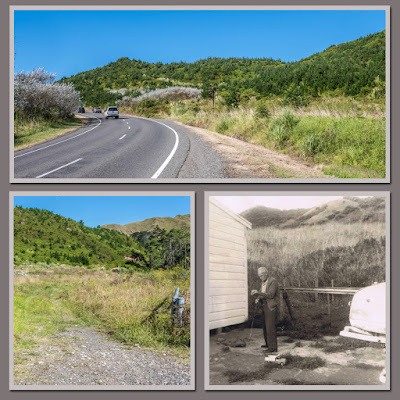 The house is long gone, just a farm gate and a gravel entrance now, but it's where we stayed on some of our very first visits to Mahia- I remember sleeping in the old cast iron bath when we had too many visitors; lots of blankets to pad the bottom and keep the cold out no doubt. 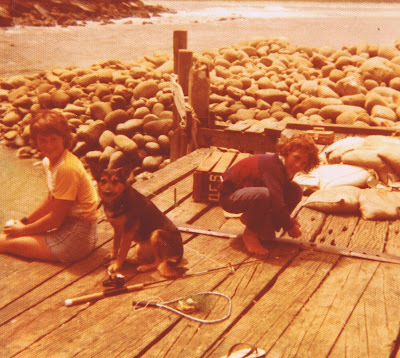 That's my grandfather (Dad's dad) setting up a fishing line at the back of the house. I would say this was in the mid 1960s. You can see the same small peak to the left in both the top photo and the old one. 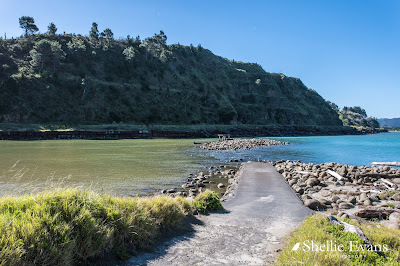 Sadly Waikokopu Wharf is no longer either, it's now just a pile of rocks. Local fishermen used to unload their crayfish catches here, I'm sure we'd often get a few crays from them too. We used to fish off the wharf regulary; here we are (circa 1967) with our daily catch- that's my two brothers, me in the middle and my sister on the right. And here a few years later (1976); my aunty, our dog Susie and my brother. I couldn't get over how many goats there were around the peninsula, and lots of billy goats too; all over the hills, paddocks, along the roads and old rail lines, everywhere you looked there were goats munching on grass. They didn't hang about though, taking off as soon as I stopped to take a photo. Mahanga, 8kms north of Opoutama, and north of the peninsula is another sleepy beachside settlement and one we stayed at a few times too. I wasn't able to locate 'our' bach although there were only a couple of short cul-de-sacs to check out. Either it has been added to or moved off altogether. The beach also didn't seem that familiar although the many shells scattered over it did, they tended to gather in the top corner of the beach. 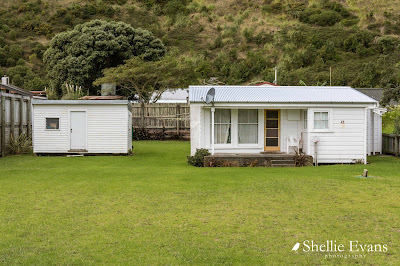 We used to collect them to take them home for the garden, especially the small NZ Wheel Shell which looks like it's still gathered to decorate gardens. We also used to walk to Happy Jack's Boat Harbour, which is just around the rocks from Mahanga Beach, in there the shells were a foot deep right across the tiny cove's beach. 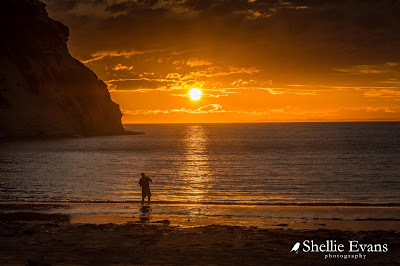 I'm sure we used to walk there over the land as well as around the rocks, I recall a friendly old Maori lady that used to live there. I thought we might be able to find a track to the harbour but it's all private land and fenced off now- Happy Jacks provides a good surf break and I suspect over the years the locals have got fed up with the intrusion. Happy Jacks Road is now flooded by a stream; it looks to have been like that for a few years. We came in from the other end but still had no luck. 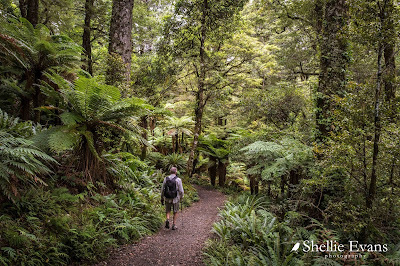 There are quite a number of shorter walks and tramping tracks (other than the Great Walk) around Lake Waikaremoana settlement and nearby Aniwaniwa (now DOC workshops but where the old visitors centre used to be). 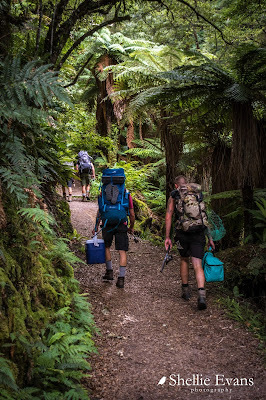 I wanted to walk the Mokau Tarns track but that was a 6-7 hour return tramp and David wasn't happy about walking that one with me so we settled for the 8km/2hr return walk to Lake Waikareiti. The sign says private boats aren't to be used on the lake. Private boats? I wondered who would be keen enough to cart their boat 4km uphill to the lake. 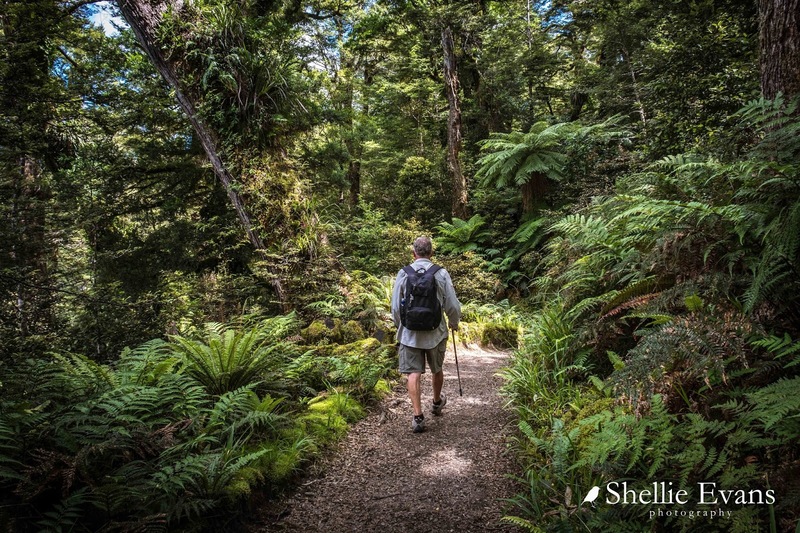 The walk is stunning through some magnificent bush, thick with luxuriant emerald green ponga and ferns beneath the beech trees and mighty rimu towering above. The wide gravel track winds steadily upwards- rising over 300 metres in altitude by the time we reach the end- and after a few hundred metres we're both breathing heavily. Our lack of regular walking lately is showing and we're thankful for the strategically placed bench seats where we take the occasional breather for a minute or so. 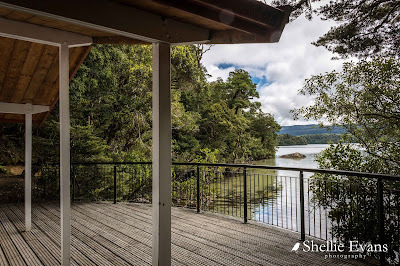 Sitting quietly, it's a great place to listen to the birds too; we see and hear all the usual suspects including the North Island Bush Robin/ Toutouwai and New Zealand's tiniest native bird the Rifleman/Titipounamu. Finally, just when we're wondering if we'll ever reach the top, we catch a glimpse of water through the bush and then a boat shed and several aluminium dinghies appear below us. 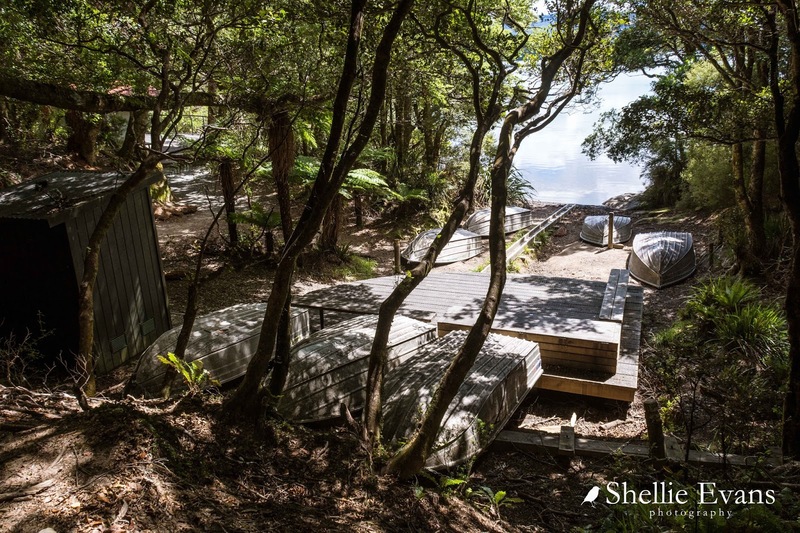 A boat shed? Dinghies? In the middle of nowhere? 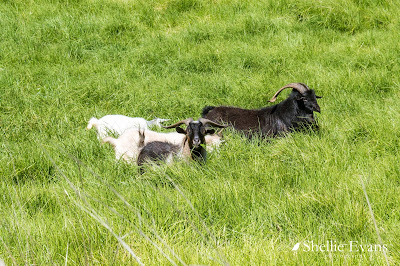 These we were not expecting to see. ...and out in front, a beautiful lake view. 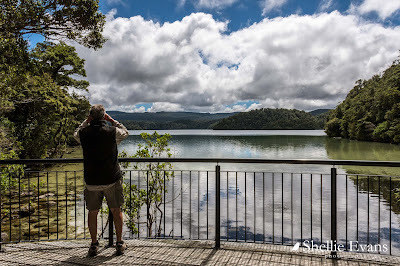 Lake Waikareiti (rippling waters) is one of the most pristine lakes in New Zealand, 900 metres above sea level and deep inside Te Urewera National Park the lake is far from civilization and browsing animals and the water and surrounding bush are pristine. 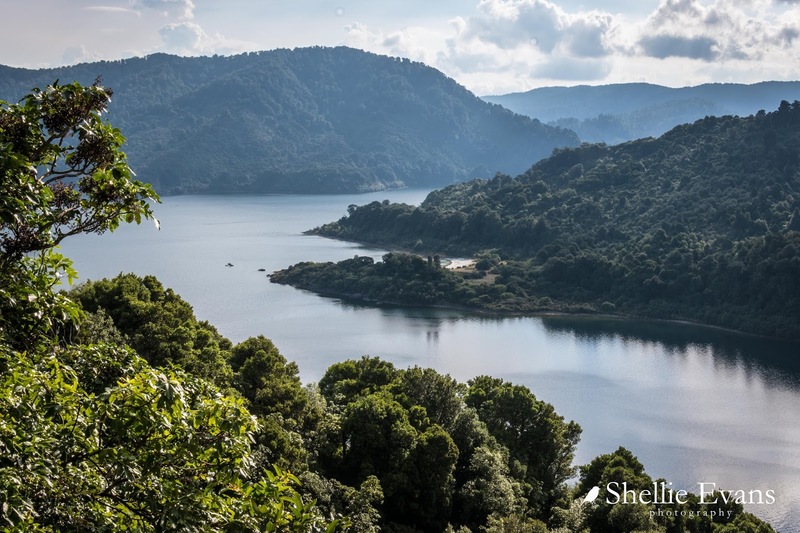 The lake itself isn't that big but it's still large enough to have six islands of various sizes in it. One of these islands, Rahui also contains a small lake. 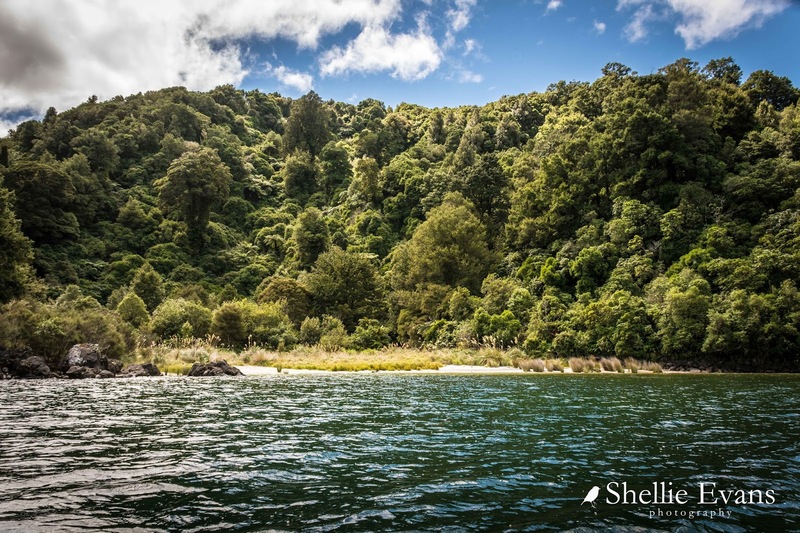 It's one of the rare New Zealand islands that has a lake in an island, in a lake in an island. Some of you will remember the blog I did on the more famous of these unique islands Mou Waho, a beautiful island in Lake Wanaka. In fact Mou Waho had one extra step! 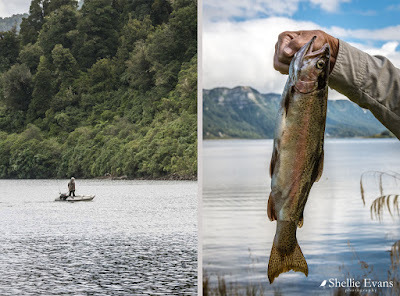 It has a tiny, tiny island in the top lake (make sure you click on the link to see the magic). 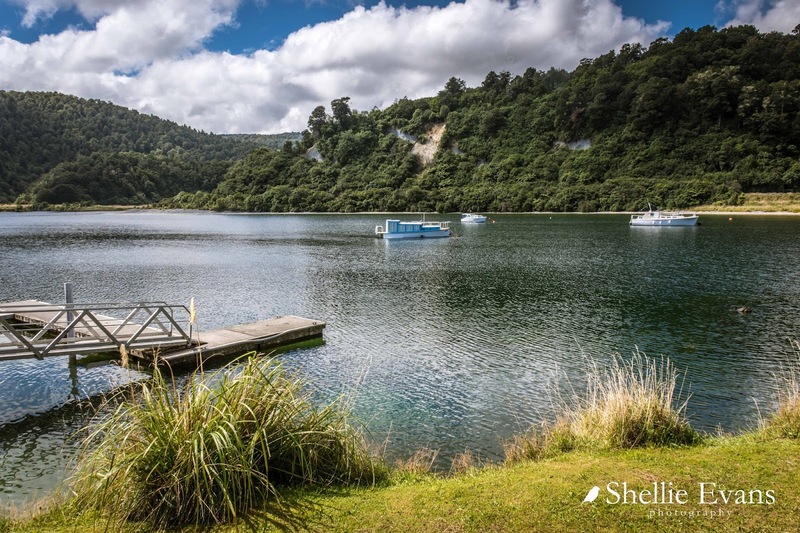 People can hire the dinghies from DOC and row over to Rahui (as long as you book it at the visitor centre before walking up here, otherwise you'll have a long walk back to get the key!). 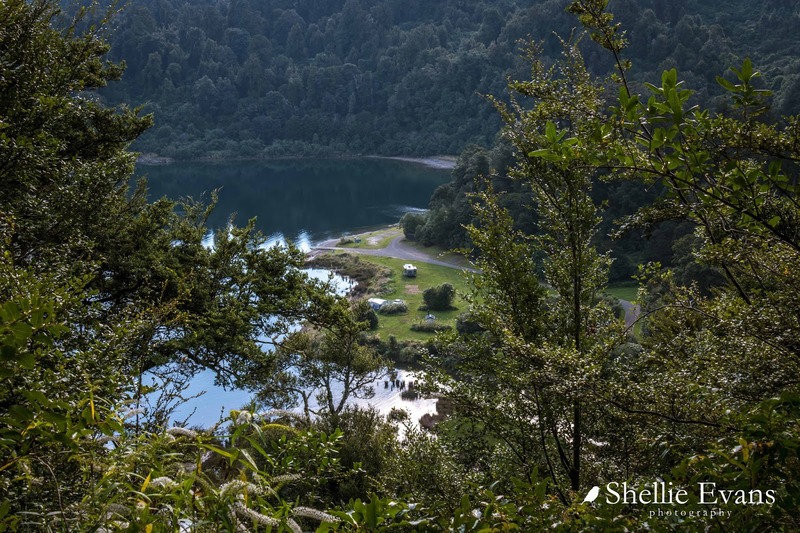 There's a short track up to the top of Rahui where you can see the smaller lake. 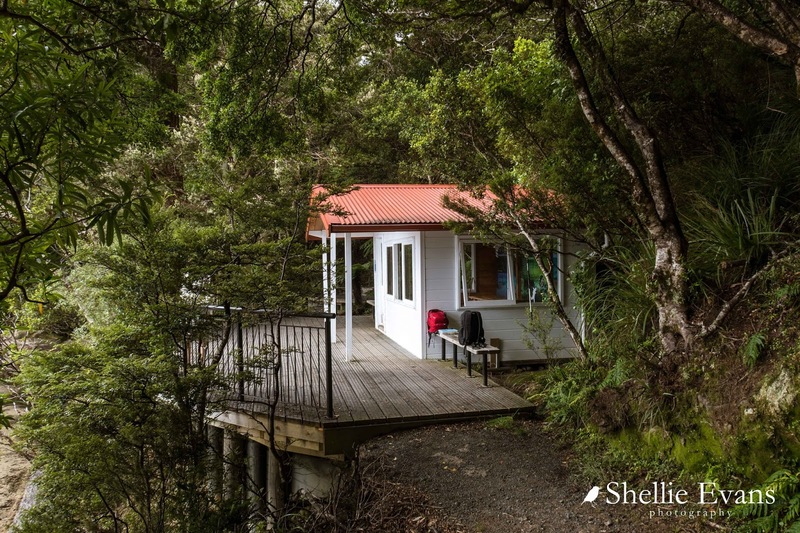 You can also row across Waikareiti to Sandy Bay where there's a DOC hut. The walk around the lake takes 4-5 hours, rowing on a good day about 30 minutes. It's hard to believe but hire boats have been available on Lake Waikareiti since the 1950s when they were hired out by THC's (Tourist Hotel Corporation) Lake House Hotel to their guests to use while staying at Lake Waikaremoana. Hireage was transferred to Urewera National Park Board (and now Te Urewera) in 1970. This must be one of the more unusual DOC walks we've done; it feels a little like an abandoned, slightly shabby, lake-side resort up here, where there's no people and not a hotel in sight! ...and we have to make do with crappiest (pun intended) long-drops we've ever come across. It's time to head off back down the track. 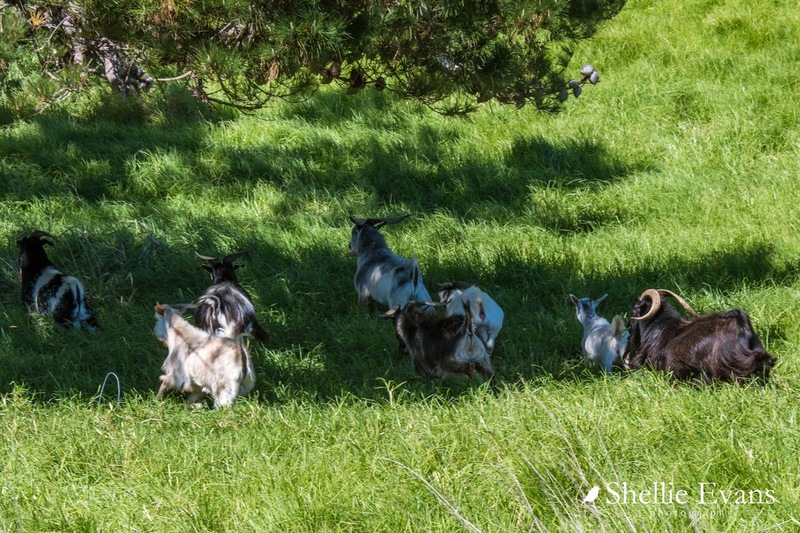 It's a great feeling knowing that it's downhill all the way! Even if our knees and toes start to complain long before the half way mark. 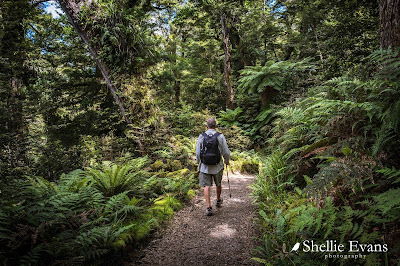 For one of the few times on a walk, I put my camera away in my pack on the way up- it was easier to concentrate on walking than taking photos- so now I have it out and take photos on the way down instead. We hear them approaching long before they pass us; four guys chatting away and laughing with each other. 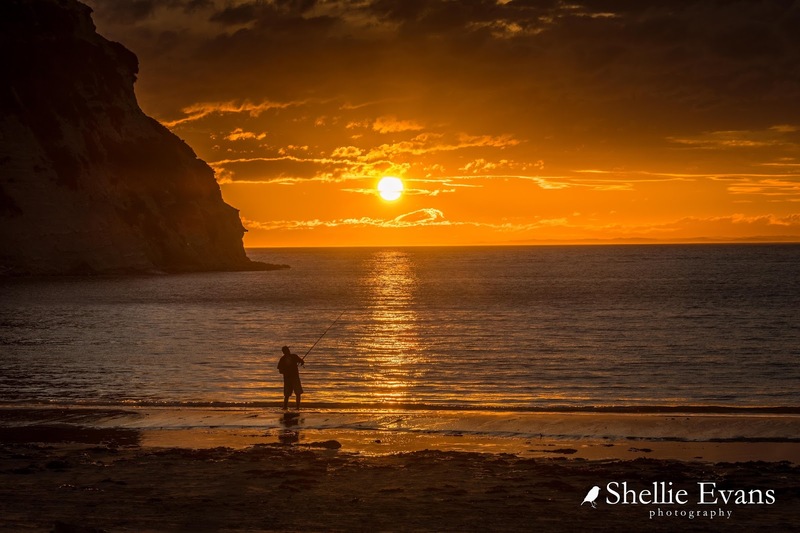 They're obviously on a high as they head to Sandy Bay Hut for a few days fishing (via the track, not by boat). They're loaded up with a lot of fishing gear, chilly bins and packs and they still have a very long way to go. I wonder if they'll be in such high spirits by the time they reach the hut. 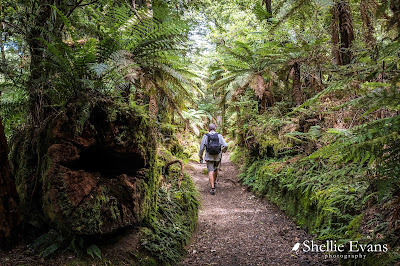 I take my time, stopping to take photos of the beautiful tree ferns along the way. David strides off ahead of me, he's keen to get back to the carpark. I'd highly recommend this walk if you're in the area. After the walk we drove around to the Waikaremoana settlement where there's a store, fuel, marina and a holiday park. It's also where the new (2016) Tuhoe Tribal Office & Visitor Centre is located. 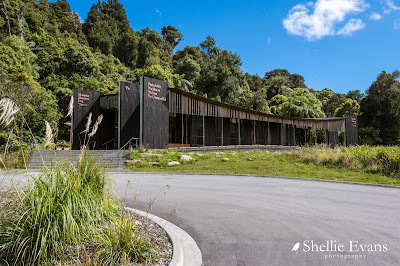 This replaced the old Aniwaniwa Visitor Centre (the one I remember visiting a very long time ago), it closed in 2008 after being deemed unsafe and was later demolished, some of it's timbers were used in the new building. The controversial Colin McCahon 'Urerewa' triptych also hung in the old building. It now resides in Tuhoe's head office in Taneatua. On the way back to camp we took a side road which runs alongside the Aniwaniwa River, a sign post pointed the way to another waterfall. We could hear the roar of water as soon as we pulled into the carpark but couldn't see the waterfall through the bush. 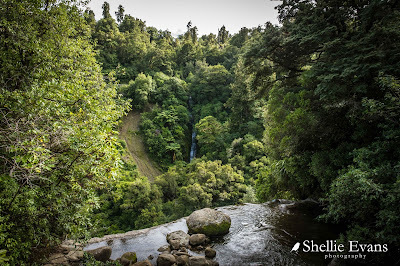 A short track led us to the edge of a deep pool and the spectacular Papakorito Falls. 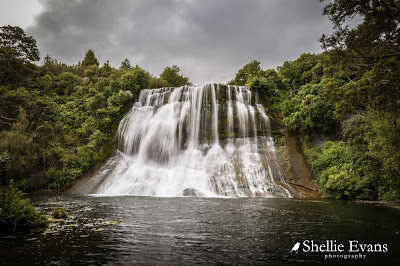 I'd have to say the waterfalls we're seeing are magnificent, there was another one nearby which we didn't check out because I was going to return with my tripod at a later date. But as I have learnt time & time again, it's best to do things then and there because you never know when your plans are going to change or the weather is going to pack up. And pack up it did! 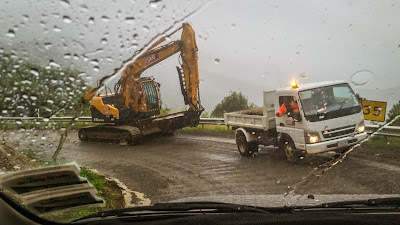 The forecast was for heavy rain and storm conditions approaching; we decided to head off the next day before we were forced to sit the storm out due to road closures. The rain arrived earlier than expected and we woke sometime in the wee small hours to torrential rain and thunder. It bucketed down for the next 4 hours and by 6am we were getting a little worried we'd not be able to pull up and out of the Mokau Landing track, even with 4WD. 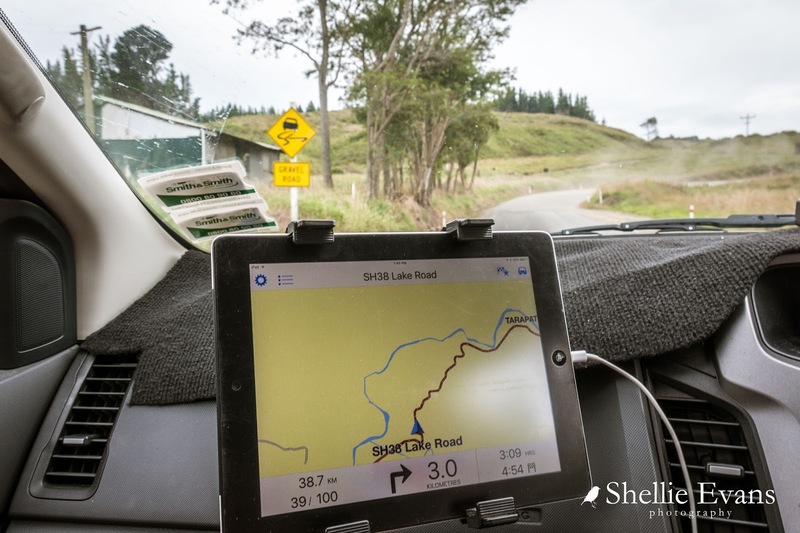 We were also concerned the road out to Wairoa might become blocked with slips and trees so we made the decision to quickly hitch up and head out as soon as we could. Thirty minutes later we were ready to go, the track out was one muddy waterfall but we got out of there fine. 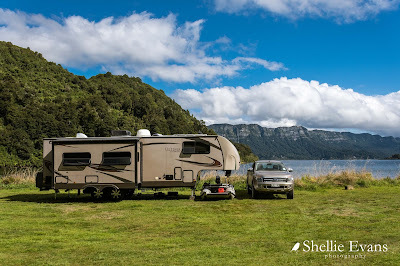 We tooted farewell to our caravan neighbours, but saw no sign of life; they must have woken up later, looked out and thought "What the heck, where did they go?" There were a number of minor slips, small rocks and tree debris on the road around the lake but generally there was just a lot of water flowing. It took us an hour to drive the 20kms from Mokau to the top of the hill overlooking Tuai. And that's when we nearly came a cropper heading down the otherside. 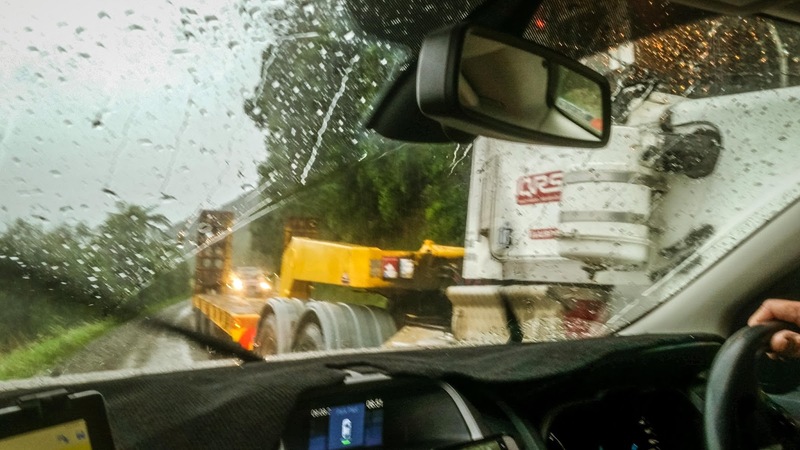 This behemoth of a truck came powering around the corner ahead of us, jammed on his brakes and skidded to a halt with inches to spare between us. For the first time, that I can recall, David had to back up to let him past, not only back up but back up hill for a hundred metres or so. Size won this match hands down. With that scary encounter out of the way, we weren't even to the bottom of the hill before the next obstacle rounded the corner. Luckily we'd seen the flashing light through the gloom further down and had pulled up to await their approach. 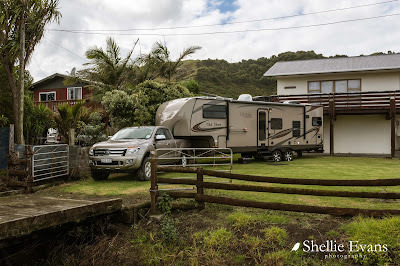 We made it to Wairoa without any further interruptions although once there the rain bucketed down again and the wind was horrendous. 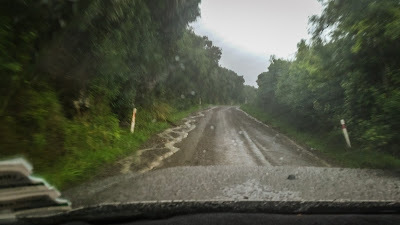 We had to get groceries and dump before we carried on to our next stop; we looked like like drowned rats by the time we'd finally finished the chores and climbed back into the ute. 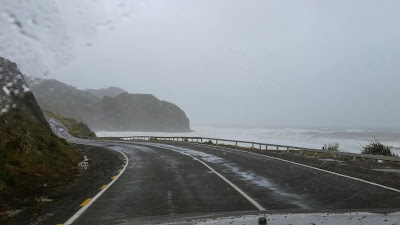 The weather didn't ease up either, as we headed north to Mahia passing the wild surf at Black Beach. We left Lake Tutira Friday morning heading north up the East Coast towards our next stop. 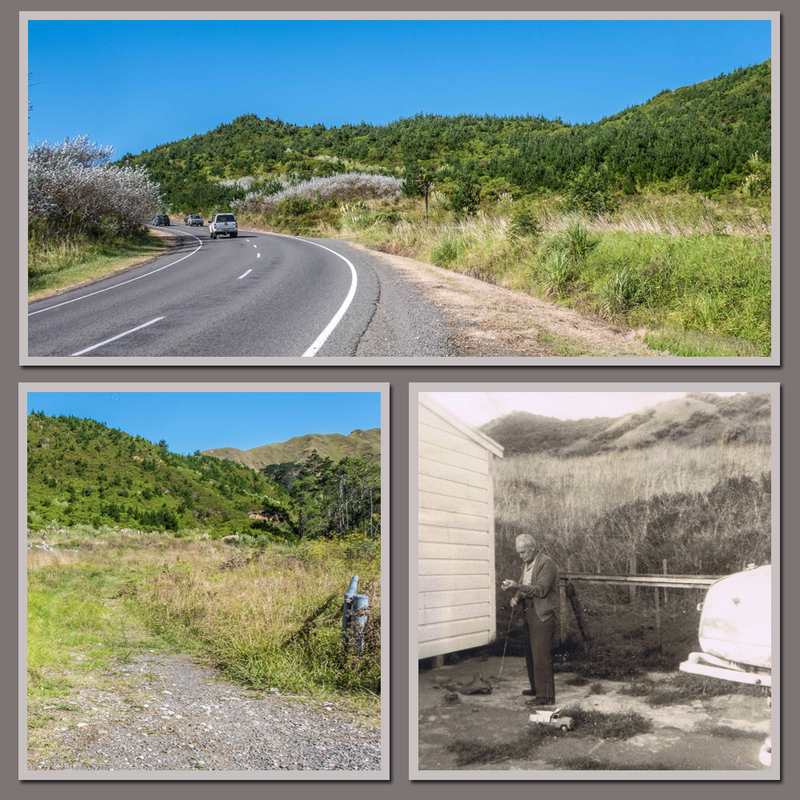 It's been a very long time since I've travelled SH2 north of Tutira, when I was younger it was the route to our family summer holidays at Mahia and I also used to visit a farm (and the Waikare Pub) at Putorino with friends whose family lived nearby. 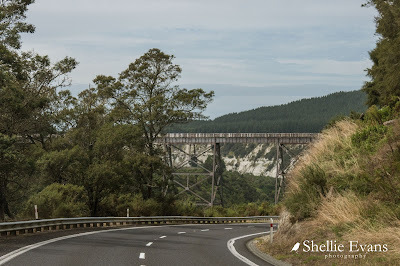 I was keen to see the familiar settlements along the way; Putorino, Kotemaori and Raupunga but most of all I was looking forward to seeing the Mohaka Viaduct again. And there it was as we rounded a corner; just as I remember it, one massive, slightly rickety looking viaduct spanning the mighty Mohaka River far below. 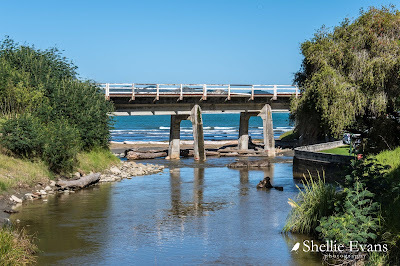 With no lookout to stop at, it was a matter of grabbing a few photos as we approached the viaduct, went under it, then as we crossed the river and one last one just before we disappeared over the top on the other side. 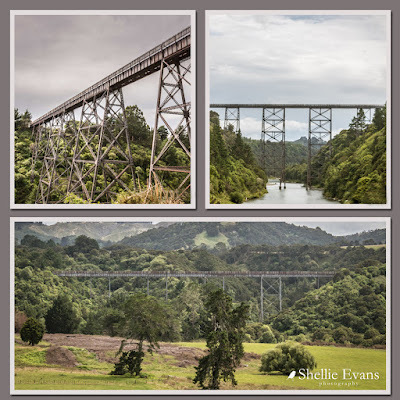 Once the 4th highest viaduct in the world and still the highest in Australasia, the 95 metre, NZ Heritage Grade 1 listed viaduct, was opened in 1937 and was in regular use until the Napier to Gisborne rail line was mothballed in 2012. 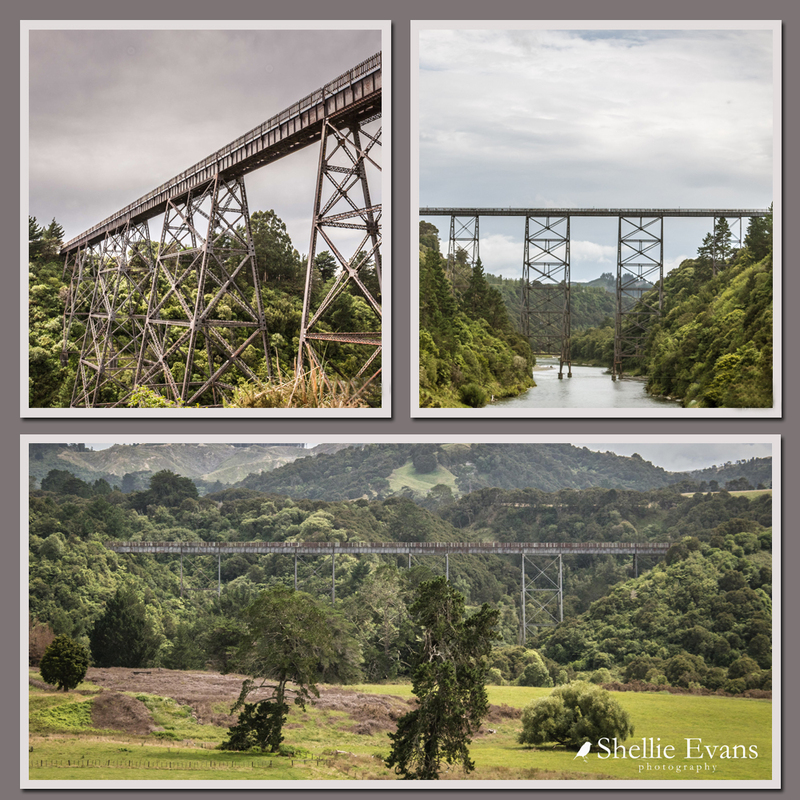 Though, just in the last month or so, KiwiRail and the Labour Government have announced that towards the end of the year, logging trains will recommence using the line on weekends from Wairoa to Napier. That's going to give a few people who live along the line a bit of a fright as they once again get used to looking out for trains. We stopped in Wairoa for a few supplies and then headed off to our next destination, keen to get there before the weather turned on us (it had been a dull grey day so far) and the weekend campers arrived. 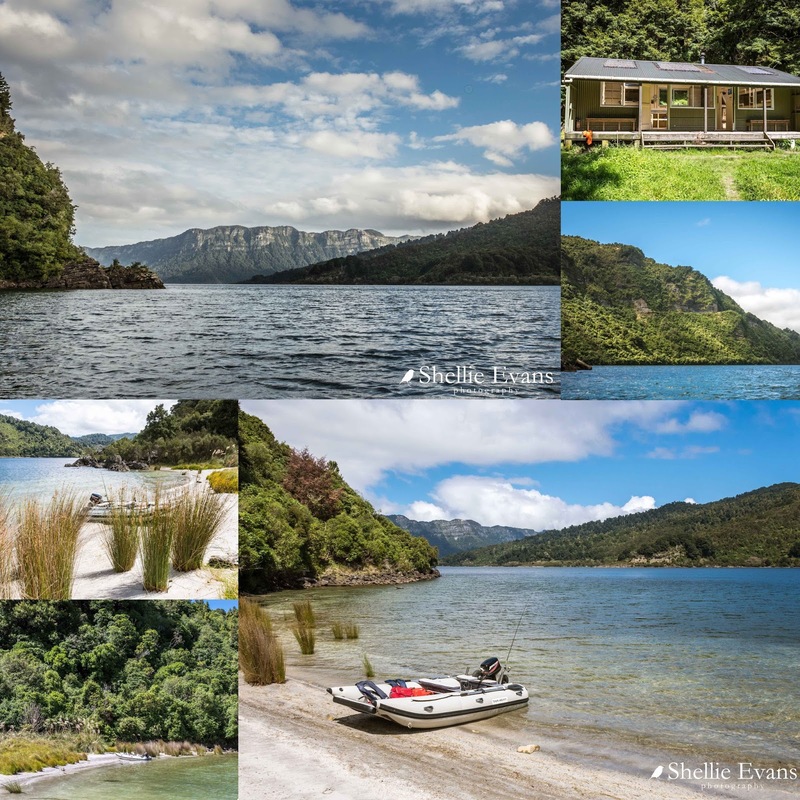 We were headed to the remote Mokau Landing DOC camp on the shores of Lake Waikaremoana, 77kms inland and deep inside Te Urewera National Park. We were holding out hope that the tarseal would last most of the way but it came as no surprise when it ran out with still 39kms to travel. Ignore the time to travel, there was a glitch in the system this day. And now we wished it was raining, just a light sprinkle to deaden the dust! There were several short random sections of seal here and there though; some past farm homesteads for obviously reasons but others for no apparent reason. 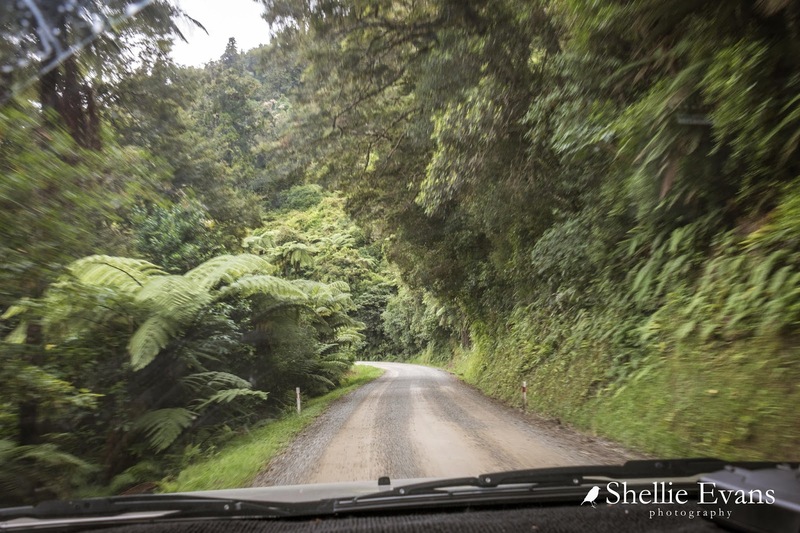 Much of the gravel road was deeply corrugated and I felt sorry for David as he cursed and mumbled under his breath. He'd spent the last few weeks polishing, painting underneath and cleaning the rig. 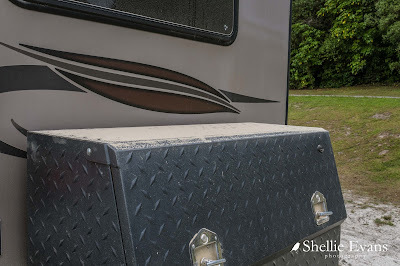 By the time we arrived at the camp a thick layer of dust coated it from top to bottom. There was no time to stop for photos at the top of the climb above the Tuai Power Station and Lake Whakamarino or looking down the other side to Lake Waikaremoana. I was hoping that I'd be able to return to Tuai at a more leisurely pace sometime during our stay. Mum has a cousin, who with his family, lived at Tuai for many years. He was a local Maori elder/Kaumātua and a water taxi skipper for trampers on the lake's Great Walk. He was killed tragically in an quad bike accident a few years ago. During our stay I did manage to speak to several people who knew Noel well. 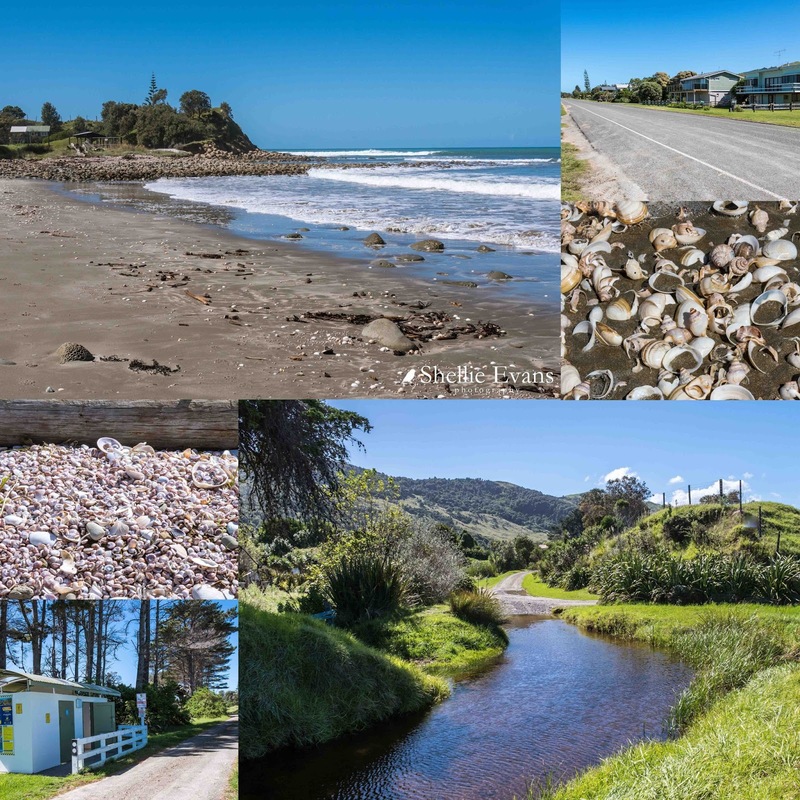 Unfortunately I didn't get back to Tuai, the road and the weather kept us at Mokau. It's 12kms from the Waikaremoana campground to the DOC camp at Mokau Landing. The road is even narrower and windier than we've already experienced. With very few places to pull over and many blind corners we were lucky to not have met anyone coming the other way. 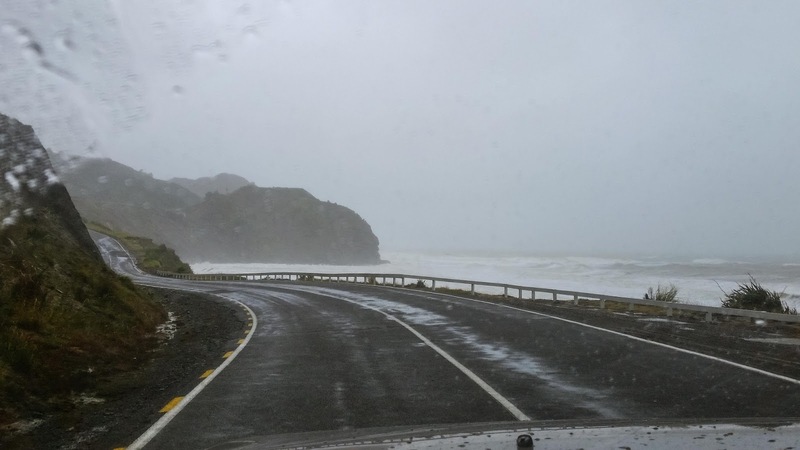 This is State Highway 38 from Wairoa to Murupara and beyond. 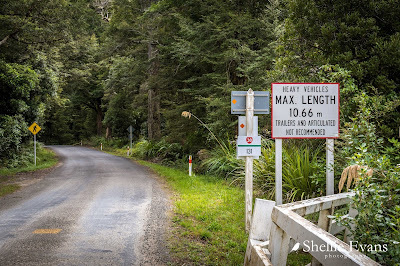 It finishes at Rainbow Mountain in the Rotorua District, a 200km long winding road, much of it gravel through a very remote and beautiful part of New Zealand. 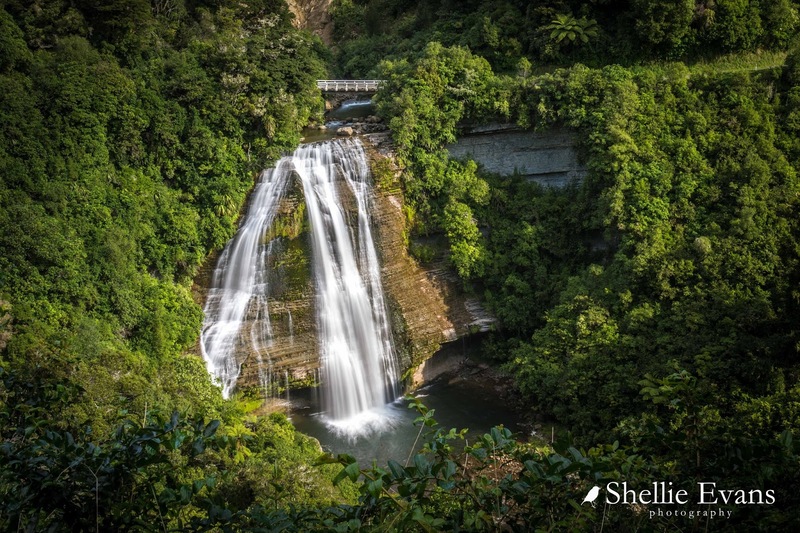 It's called the Te Urewera Rainbow Route and is touted to tourists as a stunning scenic drive. And it is. But I bet the tourists that drive it are very pleased when they reach the other end. You only want to do this road once in your lifetime. We have driven it- there and back- a very long time ago in our regular car. We have no intentions of repeating the exercise! Finally we reach the turn off down into the Mokau Landing Camp. We're half way down the track before we realise that this is even narrower than the road. I got out to check around the blind corner, to make sure no one was heading up and when I looked back I could see David was suddenly more concerned with getting around the corner. There's no turning back now. I needn't have worried about how busy the camp might have been over the weekend which was one of the reasons we left Tutira on Friday. 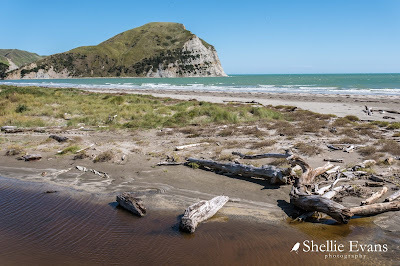 Mokau is a large site with several areas to park- beside the Mokau Inlet and stream, at the back of the reserve, on the lake front or round the corner in a bush clearing tucked into another bay (a lovely spot but with no views of the lake). 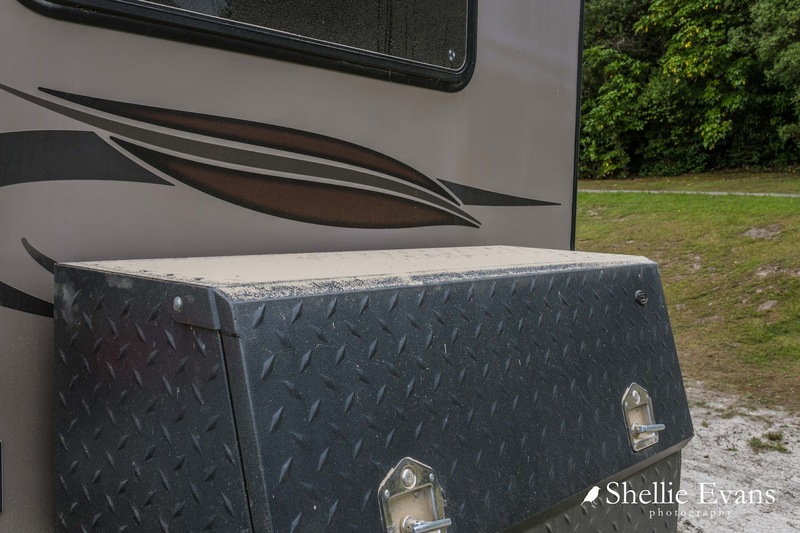 We set up right on the lake front and not far from the boat ramp. There was one other couple and their caravan when we arrived and we had 3 or 4 others come in over the weekend and then we were on our own again for the rest of the week with the caravan couple (hi Chris & Bernard!) and one or two tourist campers in each night. Folk who just couldn't go any further after driving the Rainbow Road me thinks! 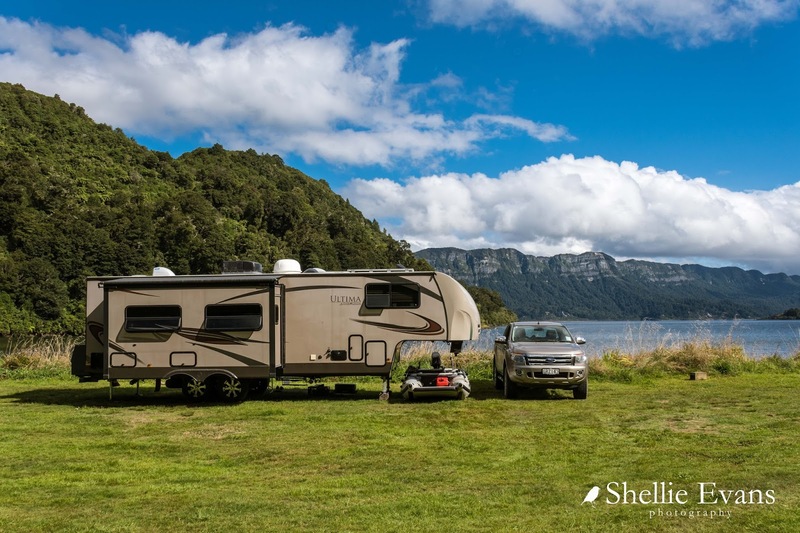 So far we've seen none of the overcrowded camps in the North Island that many people have complained about. 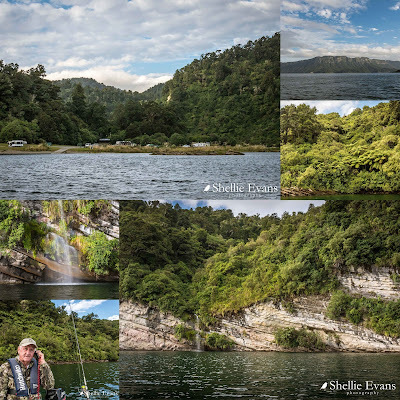 But then again, we tend to visit the more remote places or ones off the usual beaten track. We'll see how we go the further north we head. 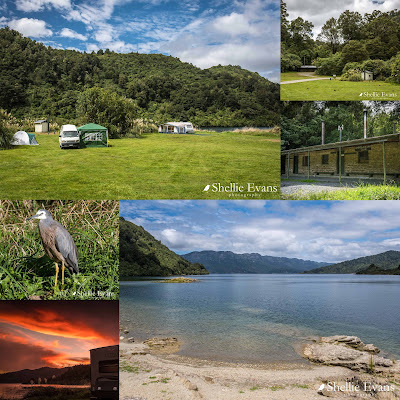 Photos clockwise- Mokau Landing DOC Camp, Wairoa Anglers Lodge at the rear of the camp, lake front view, sunset at Lake Waikaremoana and a friendly White-faced heron/Matuku Moana who sunbathed each evening on a nearby clump of dirt. 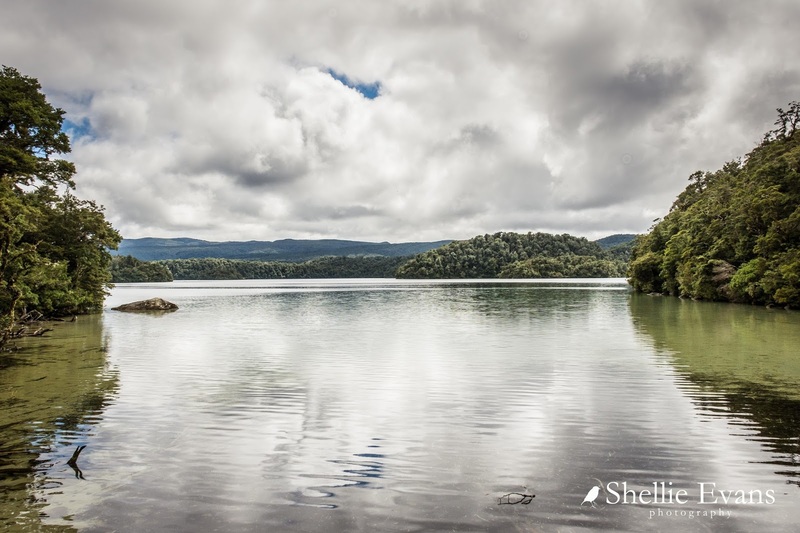 The Panekire Bluffs are a prominent feature of Lake Waikaremoana and can be seen from many different vantage points around the lake. 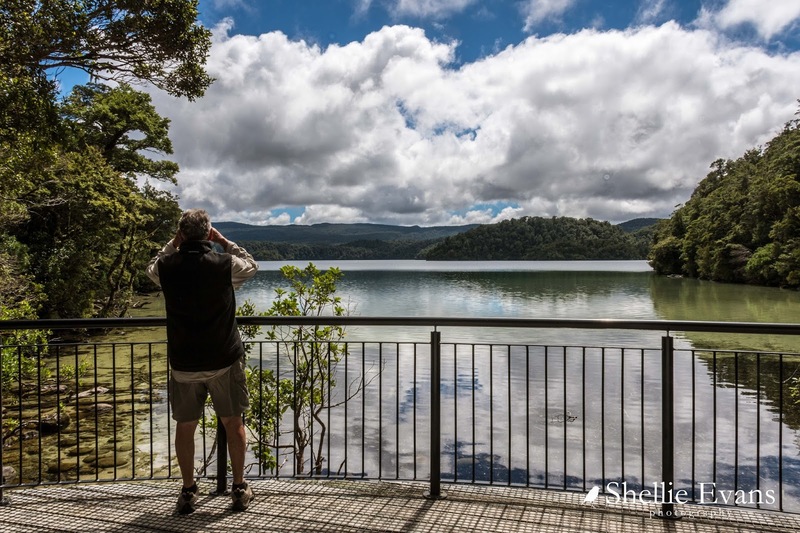 The Lake Waikaremoana Great Walk starts off to the left of the bluffs at Onepoto and passes along the ridgeline on the very first day of the 3-4 day walk. David had the Takacat up and ready to go not long after we arrived and contrary to a few comments from other fisherman about the fishing being hard, managed to catch four trout on two outings. Usually a catch & release fisherman, it was time to bring one home for dinner. In fact he bought two home in the end because I had a new recipe I wanted to try out. We smoked the other one. ...one to see a waterfall he'd found. He'd seen it in good light as the sun went down but by the time we arrived back, the sun had disappeared. And bobbing about in a little rubber dinghy is not conducive to getting a slow-mo shot of the water falling, but still, it was a lovely setting. 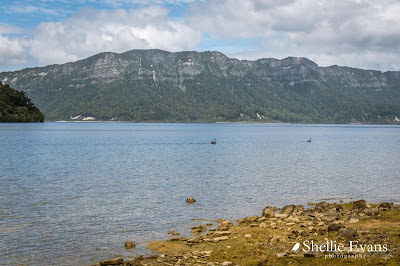 There was another reason we headed out in the boat several times with no particular place to visit; we had no cellphone or internet reception at the camp but if we motored out into the bay we managed to pick up a Vodafone signal. 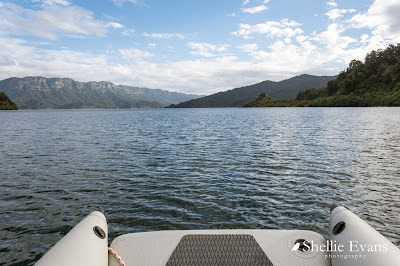 Normally having no reception wouldn't be a problem, we enjoy the break, but with two family birthdays during the week we were able to give them a call and wish them Happy Birthday while bobbing about on the water! 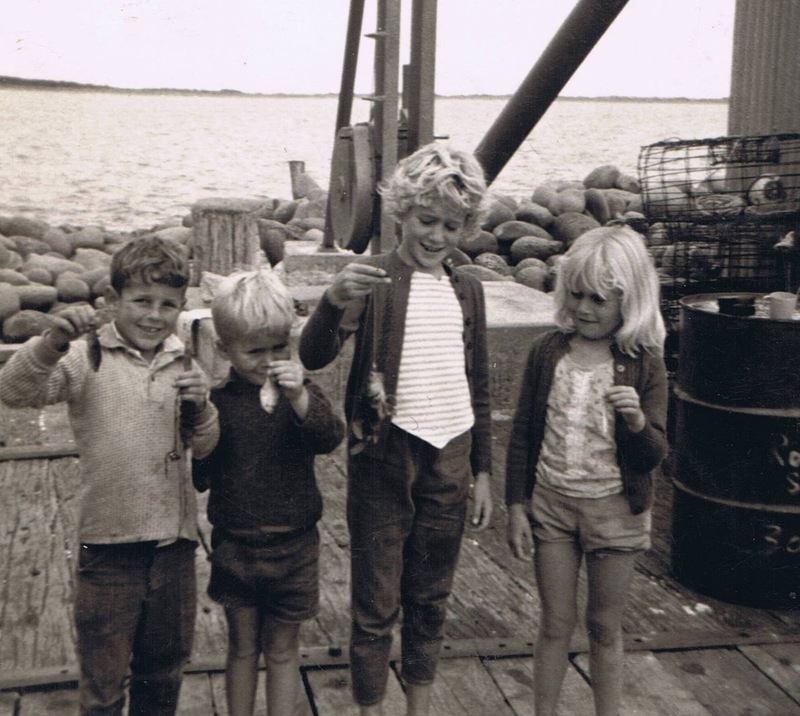 (the red cord David is holding is the quick-cut line to the outboard). On one trip we pulled onto this tiny beach to have lunch. 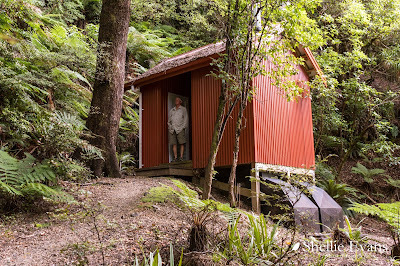 David found quite a large abandoned camp site in the bush behind- grass flattened, neatly stacked woodpile, fire pit and a few missing trees; obviously a family has holidayed there over summer. 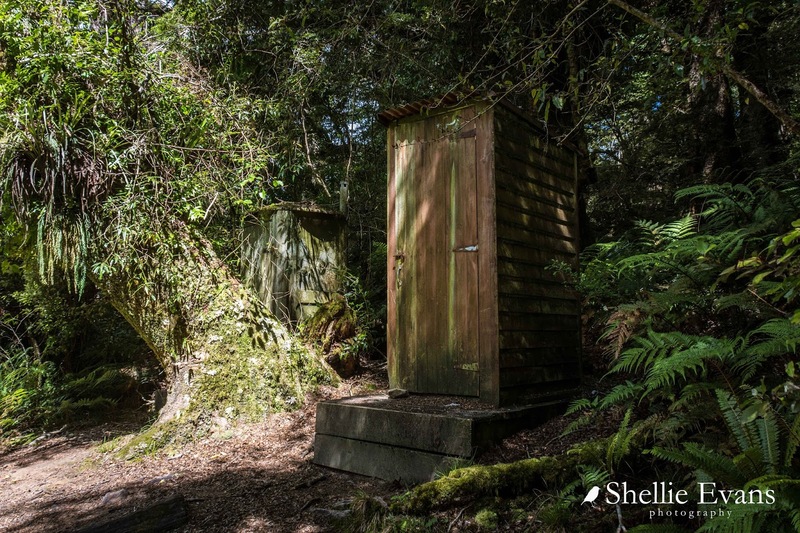 I thought I might like to walk a section of the last part of the Great Walk while David went fishing, but in the end I decided that part of the track wasn't too interesting though he did drop me off to check out the Whanganui Hut. 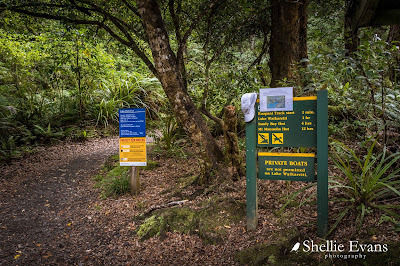 Many of the Great Walk walkers get picked up by the water taxi near the hut and don't walk the last section to the road (you can see the road cutting around the bluff in the third photo below). I spoke to several walkers who had just arrived and I talked to a hunter who had returned to the hut with his catch; sadly an older fawn. He was a little embarrassed as he'd been after it's mother but instead shot the youngster when it stuck it's head out instead of the mother. The walkers were horrified that some one had been shooting nearby. He assured them that it was at least 500mtrs from the track as required by his permit but still, I'm not so sure I'd have felt safe with somebody shooting nearby. We're told that the Mokau camp is very busy during the 'roar' (April/May); can you imagine that! Not a good time to go camping if you don't like hunting. 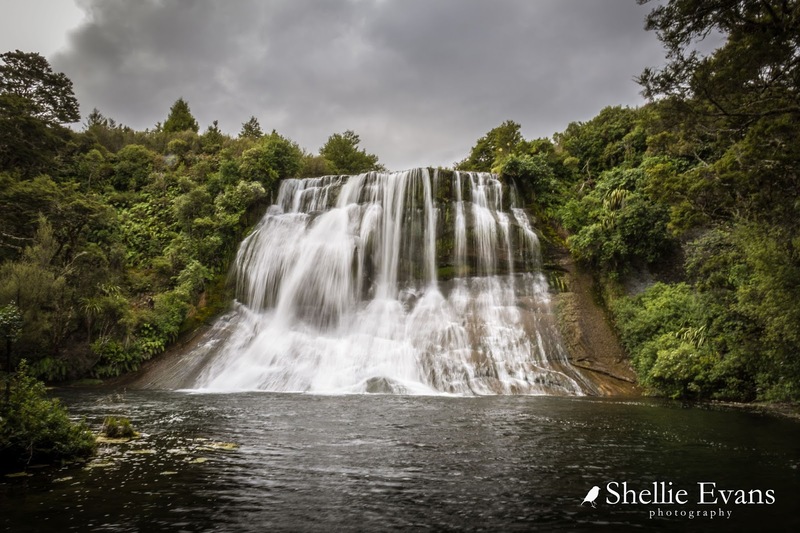 Mokau Falls- this beautiful cascade of water is at the head of the Mokau Inlet, and feeds the lake via a short stream beside the camp. There's a viewing area back up on the road, you can see the road bridge which passes over the stream on the other side of the inlet, in the photo. The Mokau Inlet has a unique feature, there are in fact two waterfalls entering the inlet, the Tauwhare Falls are on the opposite side to the Mokau Falls and can only just be seen through the dense bush (not helped by the fact that the sun doesn't shine in there either). I couldn't see them but I could certainly hear them from the Mokau lookout. I had to drive over to the bridge to catch sight of them. That's the edge of the Mokau Falls at the bottom of the photo, a very cool edge for a waterfall. I wonder how many people have climbed down there and peered over the edge. 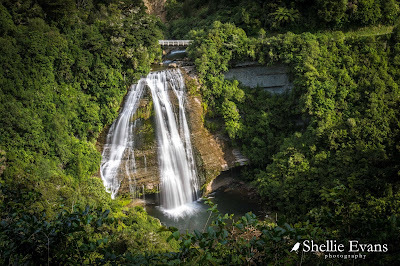 Once I had finished taking photos of the waterfalls, I drove up to the top of the road hoping to get a view through the bush overlooking the campsite. This was my first stop; you can't see the camp, that's off to the right but it's overlooking the bay and the other finger of lake where we explored and where the hut is located. We didn't stop for lunch at the beach you can see, ours was not far around the next point. I stopped a few more times and finally managed to get a clear line of sight down to the camp.